Stephen Harper has shown the ability to adapt his foreign policy position in other parts of the world, notably China, Chris Hall writes. Why is he so resolute when it comes to Israel and the Middle East? When Canada's John Baird took to the podium at the UN Thursday to condemn the vote elevating the Palestinian Authority to a non-member observer state, it was a message few in the chamber wanted to hear. The General Assembly, after all, was just moments away from an overwhelming endorsement of the move, thereby placing Canada in a small minority of opponents along with the U.S. and Israel. Nor was Canada's opposition a surprise. Prime Minister Stephen Harper had earlier this week rejected the enhanced status, calling it a ''shortcut'' to statehood. His foreign affairs minister labelled it a ''unilateral'' move that would undermine negotiations with Israel for a peaceful, two-state solution. What most wouldn't have realized as Baird spoke is that Canada's resolve to stand with Israel hardened in September at the opening of the General Assembly, while Harper waited to meet the Palestinian Authority President Mahmoud Abbas. Sources have described the discussion as curt. Though photos of the two men meeting that day show them both smiling and shaking hands. But it was apparently what happened immediately before their brief meeting that reinforced the prime minister's opposition to the Palestinian bid. Harper watched as Abbas walked through a gauntlet of world leaders who had just listened to his speech, accepting their praise and support. Few of those leaders bothered to return to the chamber to listen to Israeli Prime Minister Benjamin Netanyahu offer his rebuttal. 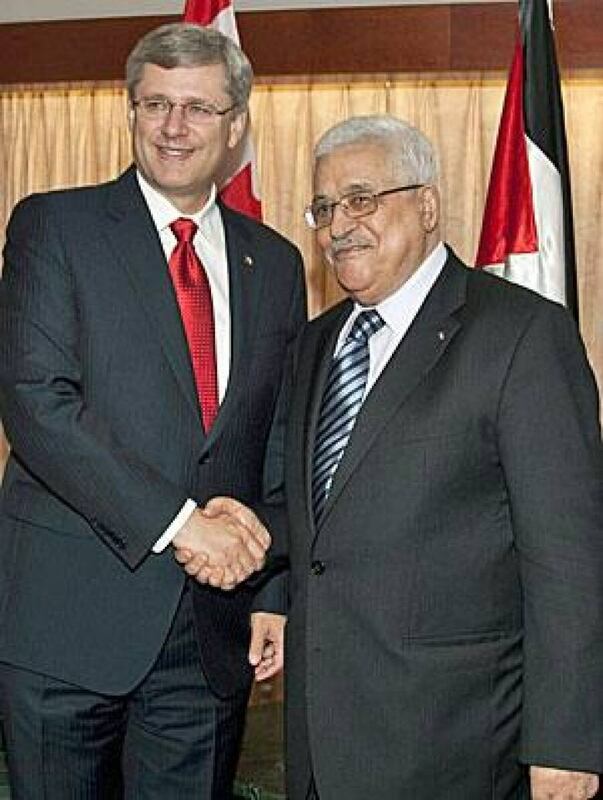 Insiders say the spectacle pushed Harper to bluntly warn Abbas privately that there would be further consequences from Canada if the push for enhanced status was not abandoned. And now Baird's speech Thursday repeated the warning, this time publicly, but without elaborating. On Friday morning, Baird announced that Canada is temporarily recalling its heads of mission to Israel and the West Bank, along with its United Nations representatives in New York and Geneva. There was speculation Canada might not renew its $300 million in aid to the Palestinian Authority or pull the credentials of Palestinian representatives to Canada. Those actions were not taken at this time but remain on the table. Whatever the Harper government does, its staunch support of Israel is clearly set, much to the alarm of its critics. Many see this harder line as a shift away from Canada's traditional role as both a supporter of Israel, and what retired Canadian diplomat Steve Hibbard recently called a more ''fair-minded'' approach to the issues that bedevil Mideast peace efforts. In an article this month for the Canadians for Justice and Peace in the Middle East, Hibbard said the Harper government has undermined that approach and Canada's standing in the Middle East. "Perhaps the most helpful step Canada could take is to use its close ties with Israel to work with Israelis and Palestinians to build mutual trust,'' he concluded. For his part, NDP Leader Tom Mulcair thinks the Conservatives are taking an ever-hardening line against the Palestinians. What should be Canada's role? In fact, there's no disagreement over the outcome Canada wants for the Middle East. The dispute is over how to get there, and the role this country should play. Baird and Harper have both said they make no apologies for standing with Israel, reminding their political opponents at home that Israel is a Jewish state, in a neighbourhood of the world that's hostile to its very existence. In his speech Thursday, Baird advanced another argument aimed at the international community. He sought to position the resolution granting the Palestinian Authority enhanced status as running counter to the UN's own history. He ran through the resolutions on the Middle East dating back to 1947, recognizing that the two parties — Israelis and Palestinians — need to work collaboratively to find solutions. It was an argument that garnered only polite applause from those in the assembly. And it left unspoken two important issues. First, Baird avoided any direct criticism of Israel's own unilateral moves. He made no mention of the expanded Israeli settlements in the territories, including the concern expressed two years ago by his predecessor at foreign affairs, Lawrence Cannon. In March 2010, Cannon, who is now Canada's ambassador to France, opposed Israel's plan to build 1,600 apartments in East Jerusalem, which is part of the occupied territories. He told the Commons foreign affairs committee that Canada firmly believes in two sovereign states living side by side in harmony. "On expansion into East Jerusalem, we feel that this is contrary to international law and therefore condemn it. We're very concerned with what is taking place." The other unspoken issue is that Canada's approach now mirrors the U.S. in saying essentially that the Palestinians can't achieve statehood without negotiating Israel's consent. While Stephen Harper has shown an ability to adapt his foreign policy positions in other parts of the world, that's not been the case when it comes to the Middle East. He has pushed hard to expand ties with China, for example, despite strongly expressed concerns in the past over China's human rights record. That shift was motivated by a desire to expand foreign trade, and to open markets for Canadian business. With Israel, the motivation is different. It's partly political. The Conservatives won their first seats in Metro Toronto in ridings with a substantial Jewish vote. And they still have designs on another — Mount Royal in Montreal — currently held by the Liberals. The other is an underlying view that Abbas and the Palestinian Authority are only reluctant partners in the peace process, and that today's vote on UN status is an incentive to maintaining the status quo rather than negotiating peace. That is not a view shared by the majority of other UN members, including many European nations who supported the bid or, like Britain, abstained, only because they couldn't get a guarantee from Abbas that he wouldn't use the new status to try to challenge Israel's occupation of the West Bank before the UN's International Criminal Court. For Stephen Harper, though, there can be no shortcuts to statehood for the Palestinians. And on that score, his government is simply not prepared to budge.